Preparatory work is already beginning in Vigo, where reconstruction of the largest stand at Estadio Balaidos is about to go forward. By Christmas we should see the final outcome. 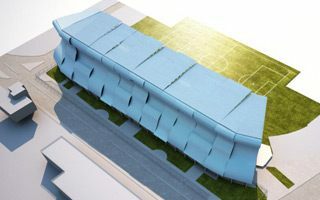 The Galician city of Vigo is about to see the second phase of Estadio Balaidos reconstruction. After last year's conversion of the north stand now it's time for the opposite straight in the south. It's the stadium's largest section but at the same time the one that will see less changes than others. Here the main structure will not be changed significantly, only new facades, roof and overall revamp of the infrastructure are planned. With La Liga over it's the best time to commence, though the second phase began with a heated argument as Celta Vigo appeared not to be informed about the city's plans. In a public statement the club expressed fears that no time frame was consulted with them, forcing mayor Abel Caballero to go on record today and assure the club that all season ticket holders will be able to watch every game of the upcoming season from the south stand. As things stand, the commonly named Grada Rio will lose its roof and undergo significant repair works during the summer. For the 2017/18 season all spectator areas will be ready to welcome fans back in improved conditions, however without the roof. New wavy cover will be assembled outside the stadium and lifted into place in winter, when La Liga comes to a temporary halt. The project worth €6.8 million represents almost 25% of the entire budget (just under €30 million) and will be followed by two further phases. The west and east curves will see the biggest change as they are expected to be almost entirely rebuilt to match the new football-specific layout of Balaidos.